I’m a qualified Ashtanga teacher, but I teach mixed yoga and in private classes I include facilitated stretching. My classes are small and hands on, so I tend to attract the kinds of people who are afraid of getting lost in the bigger classes. For the general public, I teach group classes at the Sports Performance And Rehabilitation Centre (SPARC) in the new Cape Quarter in De Waterkant. Private classes I either teach at my home studio in Greenpoint or in the private studios of my clients. I also teach group classes for the management of a local hotel chain as part of their Wellness Programme. Not nearly long enough I found yoga in my mid 20′s, and have been practicing ever since. 11 years and counting. Also not nearly long enough. 2 1/2 years. I completed my Yoga Alliance Ashtanga Teacher Training Course with Jim Harrington in Cape Town. 11 years ago I woke up one morning and I couldn’t touch my knees, (yes you read correctly … not my toes, my knees). A lifetime of sports and almost no stretching had taken its toll and I had to do something. I thought yoga might help. So I rushed off to my local gym and went to the first yoga class I could find. You know what they say “When the student is ready, the teacher will come”. And she did – Clare Ovens was teaching the very first class I happened to attend. 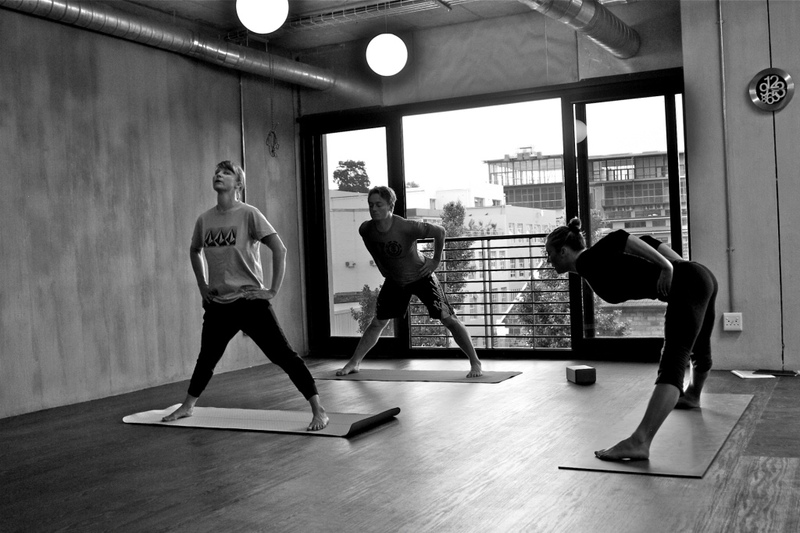 Clare is a no nonsense, powerhouse Ashtanga teacher who leaves the esoteric at the door. I was hooked from my first practice. I was fiercely loyal and over several years she coaxed me along and fanned the yoga fire. 8 years later I had the opportunity to attend the yoga teacher’s training course with Jim Harrington. I began teaching the day after I received my certificate and the rest is history. Beyond giving the gift of a practice that truly makes you feel better inside and out, (which is the reason most of my students attend yoga classes – they come to shake off the stress and stretch out the body), I love empowering my students. Yoga teaches you to sit calmly in discomfort on the mat, and people take that home with them and use it in everyday life. Yoga also teaches you that your abilities and progress can be overshadowed by fear, and with a little patience and perseverance the fear will dissipate. It is incredible to watch my students feel the fear of a balance or a backbend or a forward roll and then two months later watch them conquer that fear. And again, it’s a lesson that students take away with them and use off the mat. Yes, I focus on wellness. And I strongly promote a sporty, healthy, balanced lifestyle to my students. We discuss everything from super-foods and reverse osmosis water to stress relief and cross-training. I teach very small classes where I can adjust every single student if necessary. And I try to address the entire body with non-repetitive classes. It’s not very Ashtangi of me, but I find that students get fewer injuries, (particularly rotator cuff, hamstring, adductor and knee), if the classes are varied. And of course, it’s less boring for the new students too. What’s not to love? The benefits of yoga are countless, (yoga helps you sleep better, detoxes the body, relieves stress, improves range of motion etc etc etc). Almost anyone can practice yoga and reap the benefits and you can take it almost anywhere with you. There’s something so special about yoga, which is why I’ve named my business “The Yoga Factor”. I think Aristotle said it best – “The whole is greater than the sum of the parts”. Add yoga to your life and you’ll see. With the exception of one or two of my students, none had practiced yoga before they walked into my class. Across the board their biggest fear was fear of failure. Failure to achieve a pose, failure to be flexible, failure to look cool and composed and graceful like everyone else. My advice to new students is this: Yoga is about you and your body, (it is not about the teacher, or your friend, or that hot student at the front of the class and it’s not about how you look). Every single body is different, and the only place you can begin … is at the beginning. If you’re hesitant about attending an open class, invest in one private lesson. You’ll quickly see that the benefits far out-weigh your fears. Yes. I’m very privileged to have a home studio with a bamboo floor, mirrors and a Zen garden. I’m very big on chest openers. In today’s day and age where we close the chest so much, (to drive and work on computers and even bring the knife and fork together to eat), just about everyone needs them, including me. I don’t have a least favourite, but my biggest challenge by far has been my hamstrings. As with every muscle, there is such a fine line between stretching the hamstring and over-stretching the hamstring. Finding this line and not crossing it, in every asana, is an integral part of the practice. 17. Any religious affiliations? None. When I’m not teaching yoga, I model for Boss Models in CT. And I’m absolutely mad about running, science fiction books, cooking the perfect Thai curry and trying to learn French. Special thanks to Clare Ovens. I aspire to her greatness as a teacher. Thank you to Physiotherapist Mark Seuring of SPARC for allowing me to teach in his beautiful studio. Thanks to each and every one of my students, (the “Yogi-Babies”), for making teaching such a joy. And the biggest thank you of all to my husband for his undying support.